More Hobo Fun With Brainy Bowers! 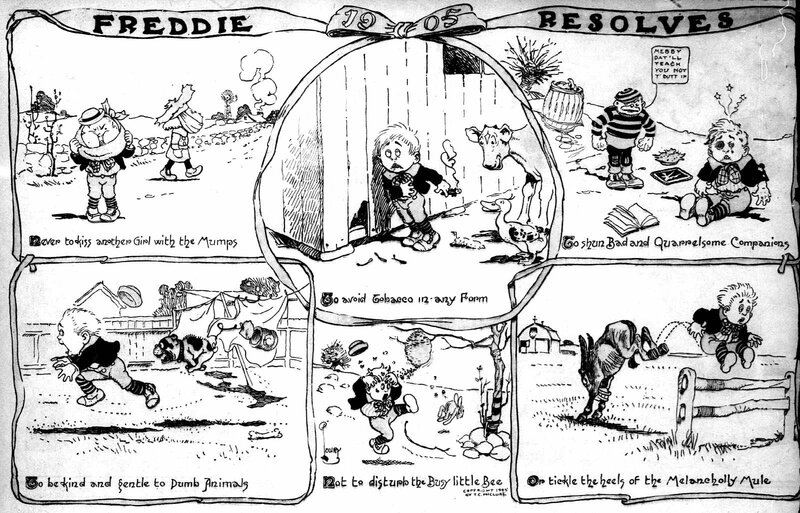 There are three character archetypes that dominated the comic strips of a hundred years ago: bad little kids, ethnic and racial stereotypes, and tramps. Brainy Bowers is most clearly a member of that maligned third class, a hobo forever locked in a struggle against cops and polite society. 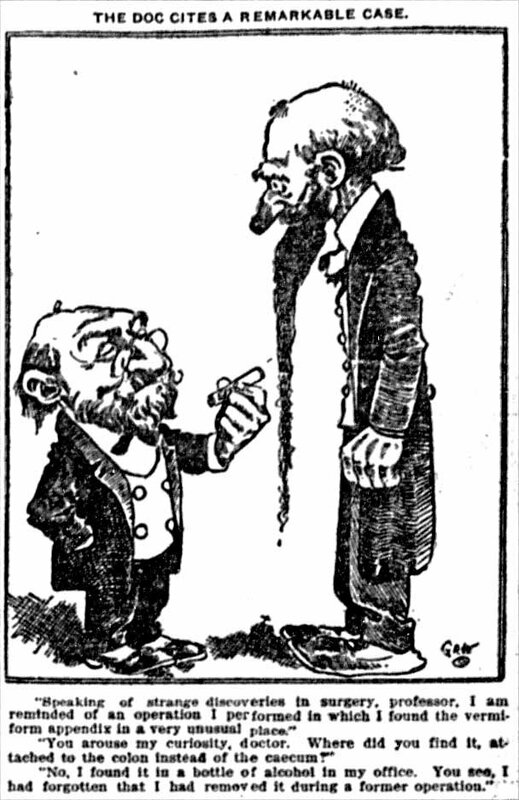 But he’s also an ethnic stereotype; though modern eyes might not pick up on it, his caricature and speech patterns (“de odder” for “the other”) would have read as clearly Jewish to its turn-of-the-(last)-century audience. 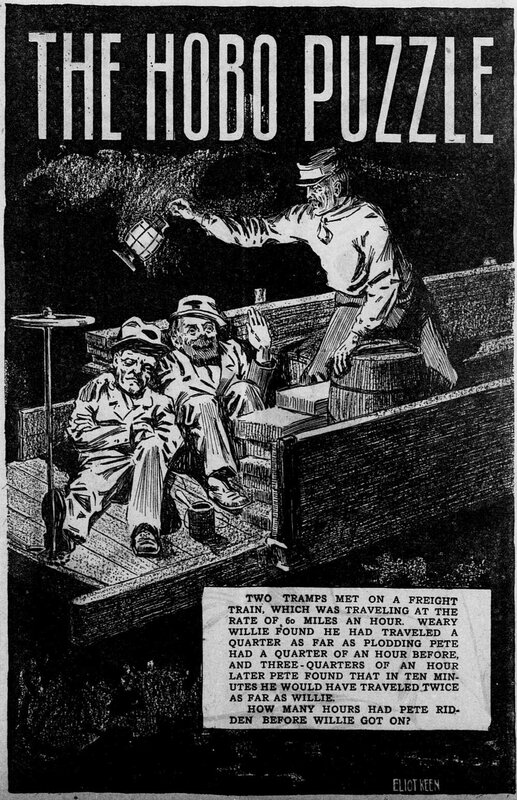 Can You Solve the Hobo Puzzle? Some strips die far, far too young. Who can say why? 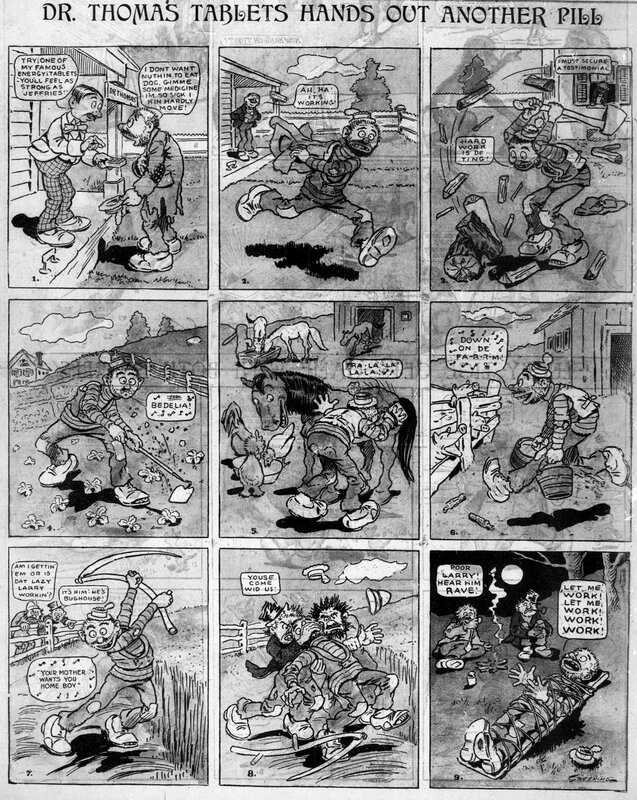 The comic business of a hundred-plus years ago was in its infancy, and consistency is all too rare. Some strips are one-off gags, hastily-inked ideas clearly valued only for their ability to fill space; some will run for a few weeks, then disappear for months, then reappear for a few more (to the great consternation of comic strip archivists such as we! ); and some seem to be going somewhere, then just…stop. 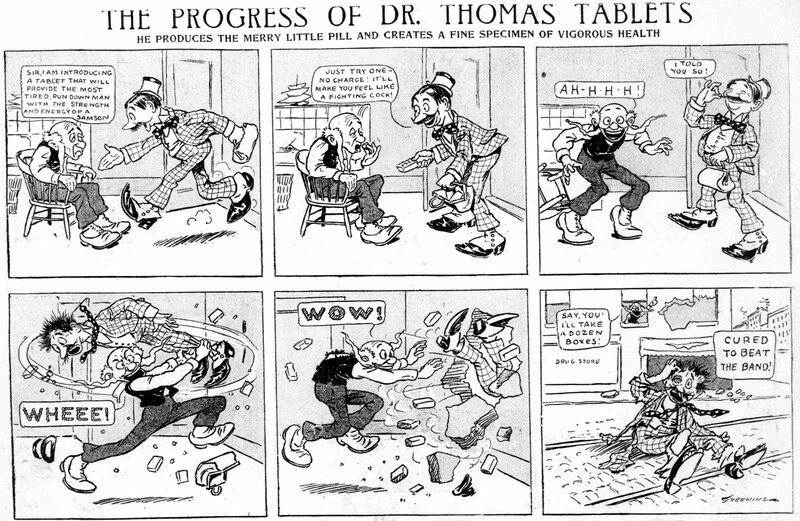 The Progress of Dr. Thomas Tablets fits in the latter category. It’s got so much going for it–a respected creator (Harry Cornell Greening), terrific artwork, funny gags, and a neat gimmick. But these two examples constitute the entire run of the strip. 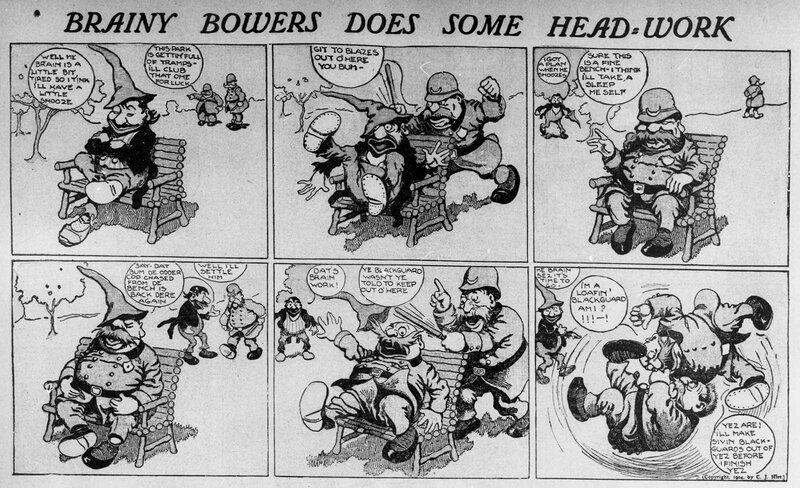 I love poring over old newspapers, culling the comic features. I really do love it all, from the mundane and workaday to the shameless ripoffs, and especially those little gems that I run across, the titles I’ve never heard before that tickle me in some way. This strip is very ticklish indeed, and I was so disappointed to look in my copy of Holtz’s American Newspaper Comics (a volume held in the same esteem by Thrillmer and I as Tobin’s Spirit Guide is by Doctors Spengler and Stantz) and find that the strip’s run was a scant two dates. So here they are, two li’l bite-sized nuggets of comic goodness. 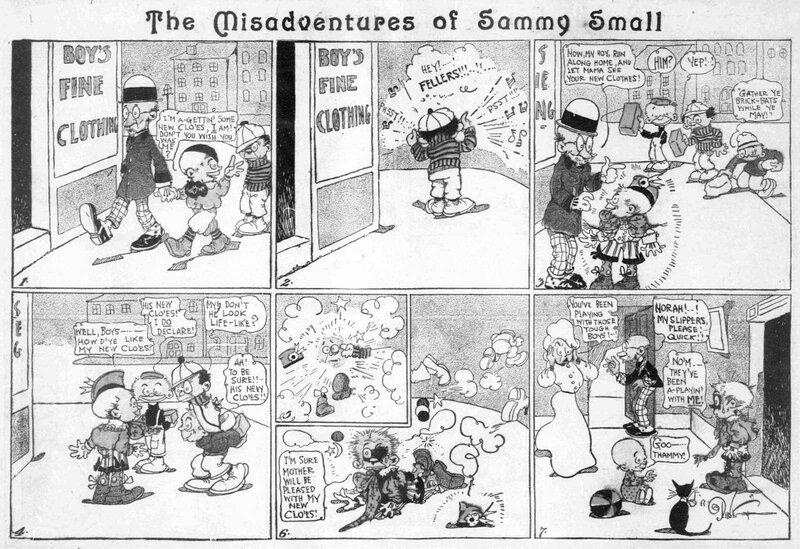 The Misadventures of Sammy Small! But as bad as you might feel for the li’l guy’s predicaments, I think you’ll be well pleased with the craft of the strip. Dink Shannon has a terrific style, rounded and full, and his design for Sammy is pleasingly grotesque. So laugh a bit, feel for the kid a bit, but be sure to drink in the terrific cartooning. You Think You’ve Got Problems? At Least They’re Not Elephants! A short and sweet run about a fellow who’s gifted an elephant named “Mohamet” from a stranger he meets in the desert. 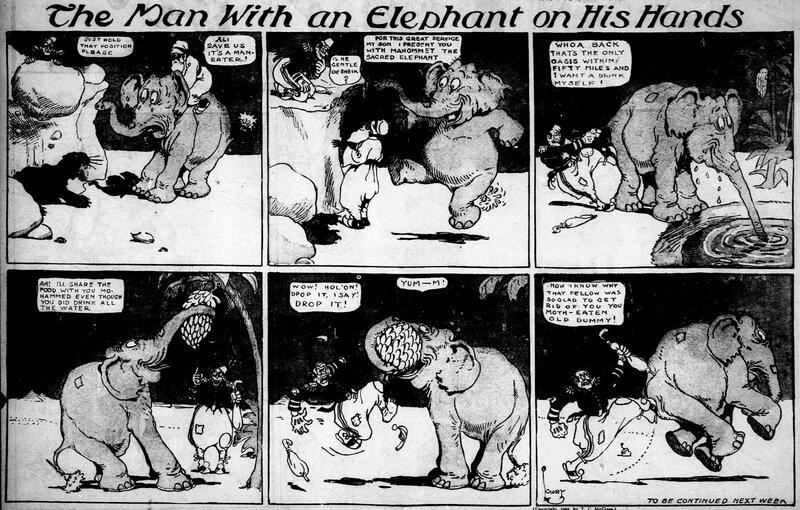 But The Man With an Elephant on His Hands quickly realizes that some gifts are more trouble than they’re worth! 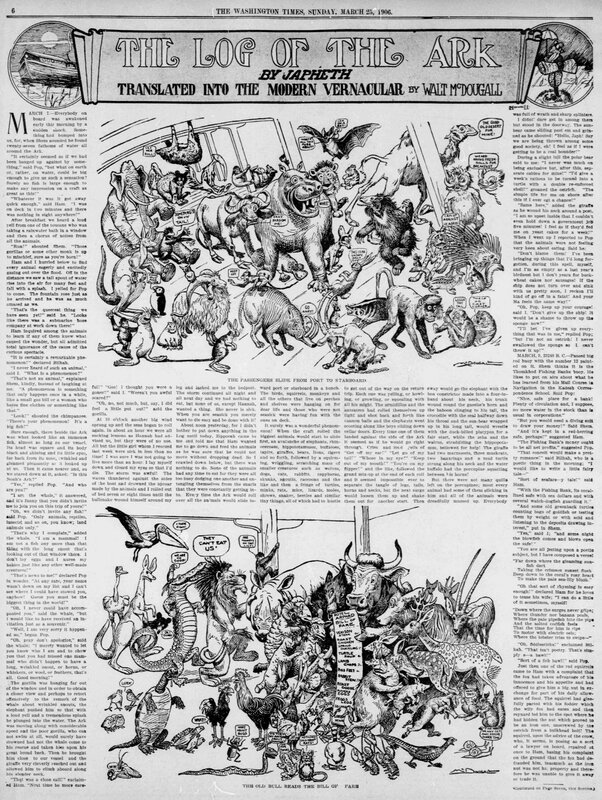 Anyway, here we have a humorous take on the Ark, an imagined page from the ship’s log penned by the always-reliable Walt McDougall, with some knockout comic illustrations accompanying the prose, wonderful crowd scenes composed of a delightful array of animals. 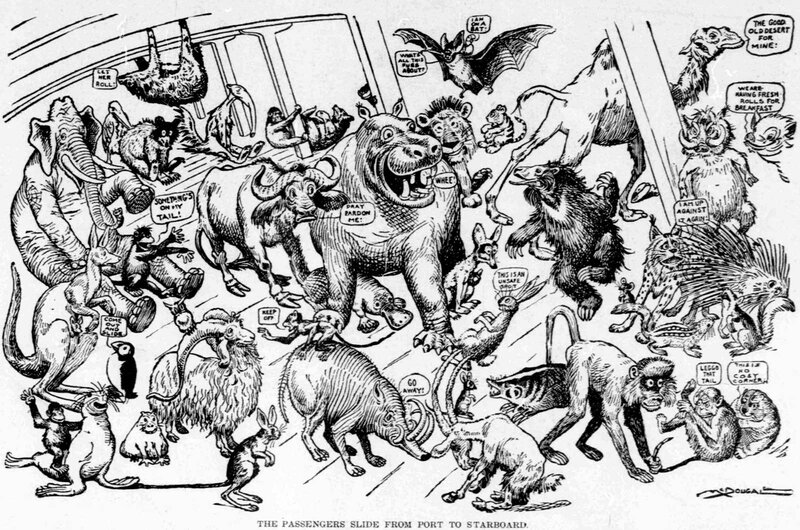 There are the expected bears and monkeys and hippos, but there are also some more obscure animals in there, like a platypus, puffin, anteater, and even a jerboa! A JERBOA! Hold on to your hats, Billy Bounce fanatics! There are Billy Bounce fanatics, right? Well, there should be! 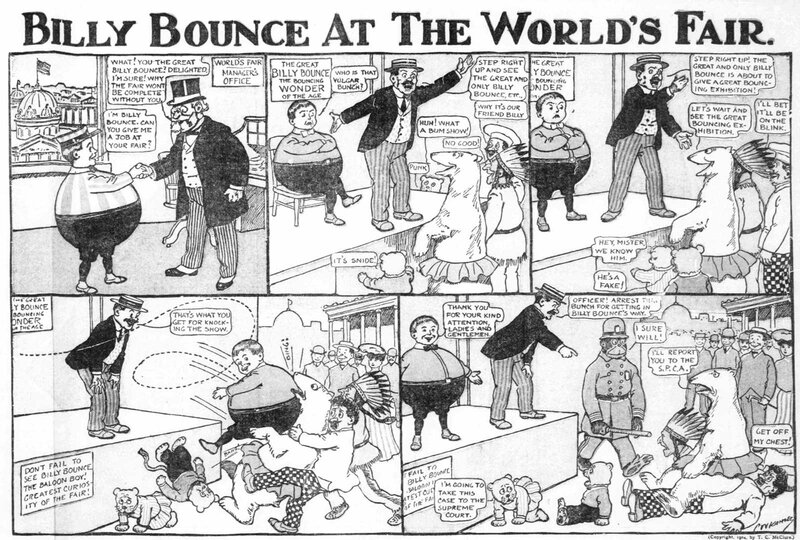 And if you haven’t been converted yet by Thrillmer’s previous postings, now’s the perfect time to join the Billy Bounce parade, following the fantastic adventures of our rotund explorer and his wonderful friends. We’ve added forty new installments, and each one is a bona-fide peach of a strip. His best friend is a POLAR BEAR, people! Get on the stick! Another great strip from Everett E. Lowry, Pete chronicles the mischief of a captive chimp in a zoo. So many comics are predicated on the notion of a malicious prankster, but here’s a protagonist who we really can’t fault! If I was taken from my home and locked in a cage, I’d be striking back every chance I got, too! It’s a Cornball Joke, but Dig That Beard!